The following story is based on the fact that non Amateur Radio trackers must use a "type approved" radio and be used on a frequency outside the Amateur bands. For Amateur Radio use, I now strongly recommend the amazing Yaesu VX-8GR, which is a dual-band radio with build-in APRS and a build-in GPS. This radio enables you do do Tracking and Voice communication at the same time. And it is also capable of receiving and transmitting Messages. More info on the Yaesu Website. The original story of the development of a non-Amateur radio tracker follows. A lot of research has gone into the choice of radio tracking. Tests where done to determine the range of VHF and UHF radio trackers, especially in dense and forested terrain. This proved what we already knew from our HAM background, that VHF signals travel much better through forest than UHF. The radio protocol we selected is APRS, which stands for Automatic Packet Reporting System. More information on this in the Technical Background. This system has been in use for many years worldwide, and has a proven track record :) And, it is fully open source, so there is a large source of hardware and firmware available, for very reasonable prices. It is important that the transmitted packets are as short as possible. Reason is that the shorter the packet, the best chance that they will be received without errors. And, more Trackers can operate on the single frequency, including the Repeaters which also need timeslots to re-transmit the packets. We use a highly compressed format, which gives packets of a length less than half a second. The drawback of this system is that we cannot use the full GPS resolution, we are limited to a resolution of 1/100 of a minute (as in: 169 Degrees 59.99 Minutes), and this translates to about 18 meters resolution on the ground. We have not found this to be a problem in our tests, as a higher resolution is not really required in tracking the location of search teams in the field. 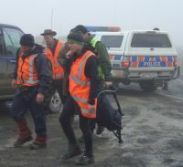 Note that these teams normally report their location in the New Zealand Map Grid, in a resolution of 100 meters! However, the Trackers are field programmable to use a different encoding scheme, which will add another two digits, and which would (theoretically) give a resolution of 18 centimeters. In reality normal GPS resolution is not better than about 5 meters. As for the hardware, we currently use a miniature GPS with a SiRFstar III chipset, which is extremely sensitive. 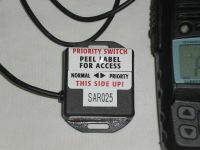 The APRS tracker unit is the Byonics MicroTrac3 SMT, which is very small, field programmable, and has many features, under which a Priority Switch option, which can transmit a special signal to indicate an event like Person Found. 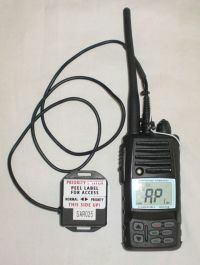 Its output is a 1200 Bps audio tone (APSK) which is fed into a VHF handheld radio. The radio has given us some headaches, as we needed to find a reasonably priced VHF radio, NZ certified, with NO digital audio filtering (which now is becoming a standard in handheld radios). These DSP filters are great for voice, but Bad if you need to feed 1200 Bps audio data through it. We originally used the Vertex Standard VX-160 radio, but these are no longer available. Our test VX-170 are not legal on the EE band we now use. We found the solution in the Vertex Marine radio HX-370 (pictured above) which is nearly identical to the VX-170, but has recently been Type Approved for VHF use in New Zealand. Even better, it comes supplied with both a rechargeable batterypack, charger, but also with a 'standard' battery pack in which normal batteries can be used. The Tracker runs for about 12 hours on the rechargable pack, transmitting every 30 seconds. From here we started working on the Digital Repeaters.